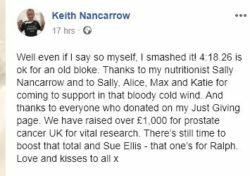 Stand up and take a bow Keith Nancarrow – known universally as Norm – who ‘smashed’ the Brighton Marathon on Sunday two years after vowing he would never run a marathon again. Norm, 57, is raising money for colleague and friend Ralph Ellis, who died last year of prostate cancer. Ralph, a very successful freelance journalist, was a keen fund-raiser himself after he was diagnosed with the disease. Norm has raised £1,000 so far. 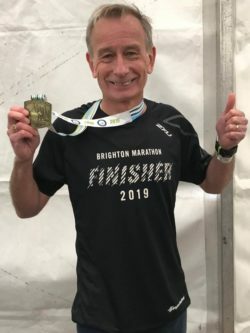 Norm ran the London Marathon on behalf of the SJA and Royal Marsden in 2017, hanging up his running shoes afterwards. But the sad death of former Daily Star colleague Ellis spurred him back into action.